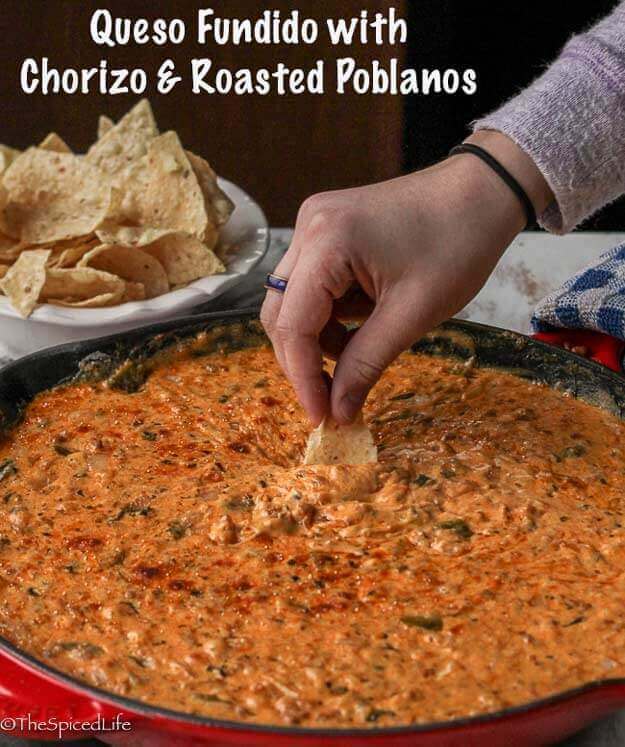 Queso Fundido with Chorizo and Roasted Poblanos is the perfect big game dip for anyone who loves Mexican or Southwestern flavors. Cheesy, spicy but not hot, and indulgent in the tradition of the best party food, it is sure to be a big hit. This is another one of those “no brainer” sponsored posts. I adore Mexican chorizo, and will always take the opportunity to get paid to create a recipe with it. But it is the week leading up to The Big Game, so dips were on my mind, not breakfast dishes. Queso Fundido is a dish I have loved for a long time. The first time I ever made it at home, around fifteen years ago (!! ), John and I both instantly fell in love. And Loki and Finnegan had the only fight of their entire lives when we gave them each a bite. 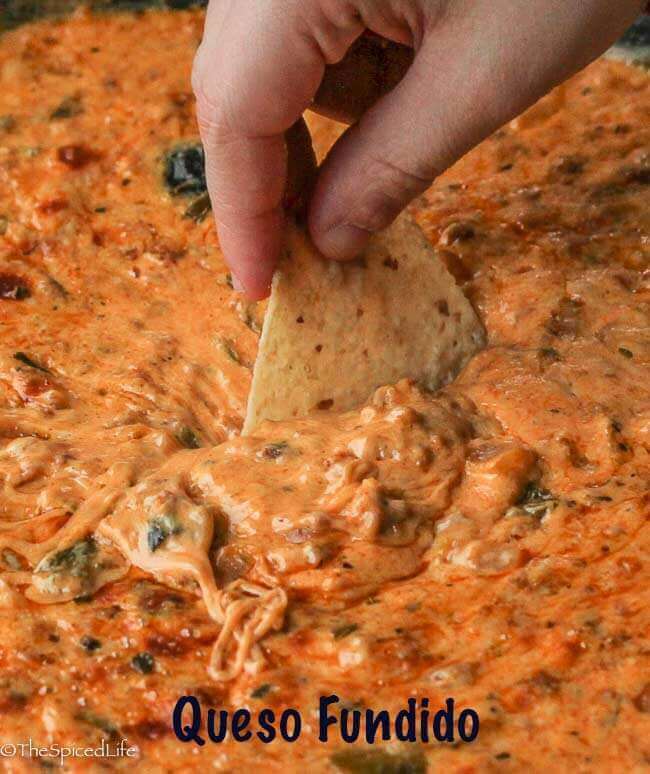 For a long time Queso Fundido was a big story in our family, the dip that was so amazing the dogs tried to kill each other over it. 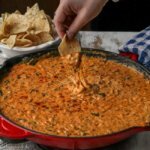 Since then I have ordered Queso Fundido at Mexican restaurants every chance I get, but it had been a while since I made it–and definitely needed to share the recipe with you! So this was a great opportunity. Queso Fundido is a little bit different from what most people expect. In Spanish, Queso Fundido means, simply, “melted cheese,” and indeed, a true Queso Fundido is pretty much just seasoned melted cheese. In other words, it does not have a white sauce base or any of the fake cheese substitutions used to achieve a more saucy quality (think nacho cheese at a ball game). 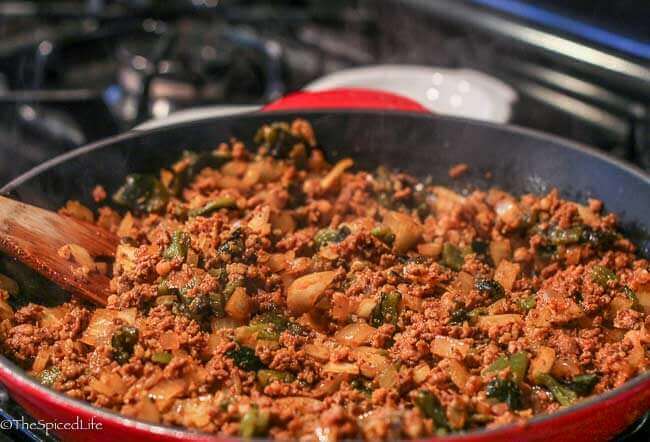 It is often made with chorizo, and Rick Bayless makes his with roasted poblanos, which I love, so I always have too. In Mexico, Queso Fundido would be served with warm corn tortillas–but I have always preferred tortilla chips both for the texture and for the stand around and munch factor. In order to help with that I have added a little cream to thin the cheese out a bit so the dip does not break your chips. Many Queso Fundido recipes are made completely on the stovetop, and mine is made almost completely on the stovetop. I do finish it with a very quick broil–not too long, as you do not want the oil to separate and cause the dip to get rubbery, but the mildly charred spots on the top of the dip really up the visual tastiness in my opinion. 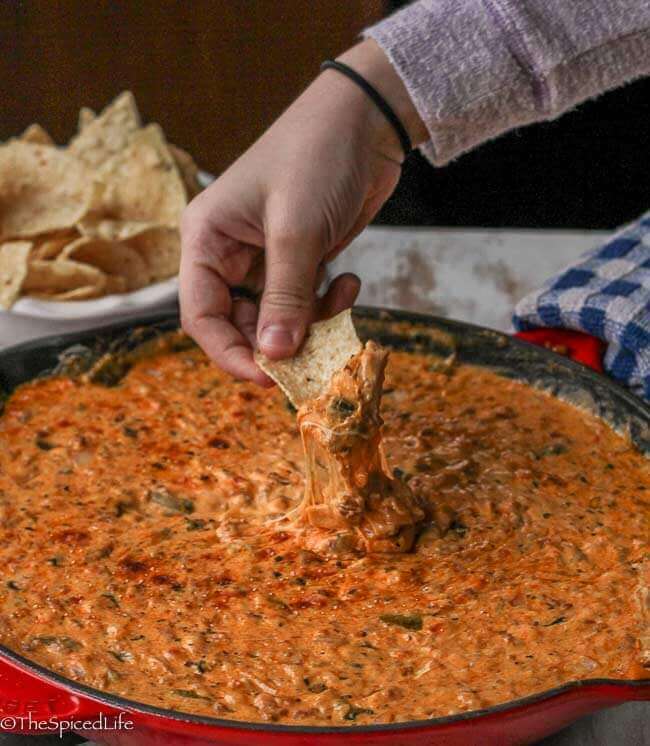 If you can serve the dip over a tea light or some other gentle warming system, great, but honestly this dip is so delicious it will not last long and people will love it even as it cools as bit. Which brings me to another issue–how much to make. The recipe, as I wrote it below, is to feed a crowd–and likewise that is why I used my gorgeous enameled 12 inch skillet. But if I were making it for just my family, I would cut the recipe by a third, and either make it in a much smaller pan (my first choice, if you have a good heavy one) or transfer it to a serving dish. Unfortunately I do not recommend making Queso Fundido ahead. You can gently reheat and enjoy the leftovers, but be aware the oil will likely separate and it will not be the prettiest stuff ever–although John and I would both argue it is still hard to stay out of! Just not pretty enough for a party. Adapted from Rick Bayless. This is written to serve a crowd, for something like a Super Bowl watching party. It can easily be divided to serve less people, in which case use a smaller pan or baking dish. Roast the poblano peppers on all sides. I prefer the broiler, but you can also hold them above a gas flame if you have a gas stove. When they are blackened on all sides, remove to a bowl and cover it with a towel. Let the peppers rest for 5 minutes. Then peel the blackened skin off, remove the inner core with the seeds, and quickly rinse the remaining seeds out. Chop the peppers and set aside. 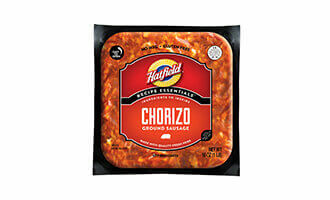 Brown the chorizo over medium heat in a heavy bottomed pan. I prefer enameled cast iron if you have the right size, because it is gorgeous for then serving the dip as well. But stainless steel works too. Break it up and let it cook for 5 minutes. Keep breaking and stirring the chorizo. Add the onions with a tiny pinch of salt. Cook until completely browned and the onions have become translucent, about 10 minutes. If you are using an attractive enameled cast iron pan, turn the broiler onto high. If you are using a stainless steel pan, you should skip the browning of the top. Add the chopped roasted poblanos. Stir and let everything heat up, about 1-2 minutes. Add the cheese in 4 batches, slowly stirring it in and letting it melt. In between batches, add the cream in 3 batches. Add the hot sauce with the cream if using. Keep stirring the entire time. When the cheese is completely melted and the dip has been stirred smooth, it is time for the broiler. If you are using an attractive enameled cast iron pan, place the pan under the broiler for a just a few minutes, just until the dip starts to brown in spots. If you are using a stainless steel pan, transfer the dip to a serving dish and proceed with serving directions below. 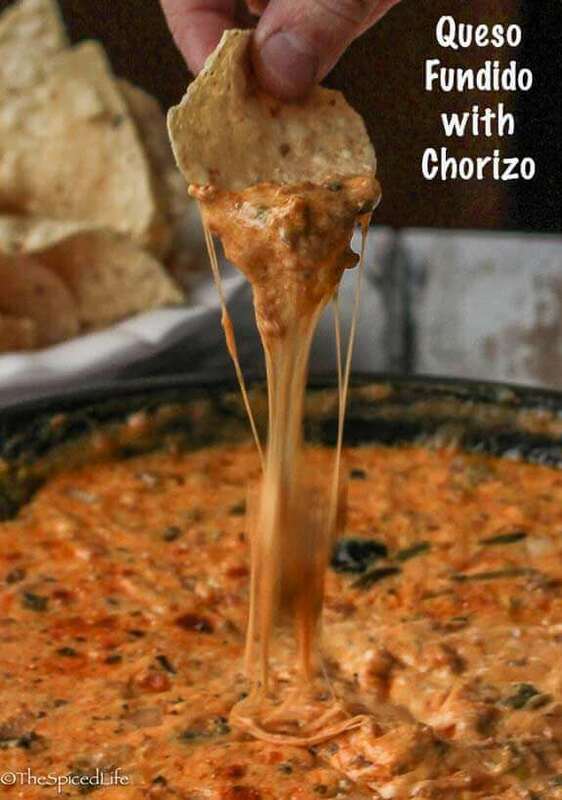 Sprinkle crumbled dried Mexican oregano over the bubbly queso fundido and serve immediately. If you can place the dish over a warmer, all the better--but this stuff is so delicious people will probably keep eating it cool! When I first learned to make this, I used exclusively Oaxacan string cheese (similar to Mozzarella)--which necessitated a trip to the Mexican market. At my local grocery store here, however, they have Chihuahua cheese pre-shredded, as well as a mix of Chihuahua, Oaxacan string cheese and Cotija pre shredded. So I bought bags of each and used a mix. If you cannot find that, I recommend looking for Oaxacan string cheese, Chihuahua cheese and then a mix of Mozzarella and Monterey Jack--in that order! The heavy cream is not traditional; I add it because traditionally queso fundido is eaten with warmed corn tortillas. The cream helps to loose the dip, so that it can be scooped by the more fragile tortilla chips. Because of this cream, you might prefer to add a little hot sauce. My kids loved it without the hot sauce, my husband practically required the hot sauce, and I was happy either way. The sweepstakes is now over–thanks for playing! Since it is just me and my husband, we are just having hamburgers. We are having wings for the big game. I am making a nacho pizza, teriyaki meatballs, homemade guacamole and chips and cupcakes for game day. I am making Nachos, chicken wings, and brownie bites. I’m making chili, nachos and chicken wings. 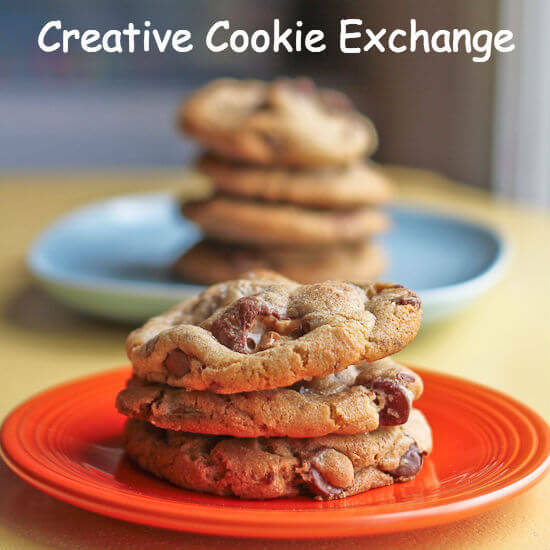 I absolutely must make this!!! We are making chicken wings. I am making buffalo chicken dip. It goes with everything and is a huge favorite! We are having nachos and wings for the big game oh and lots of chips and dips. We are making teriyaki chicken bites for the game day. I’ll make tacos because they’re always a hit and even the younger crowd enjoys them. I will be making chocolate cupcakes & chicken wings! We’re having tortillas chips with guacamole and spicy chicken tortilla soup. My kids really love buffalo wings, but we might just do a pizza. I like veggies and dip, and lots of salty snacks. I made pulled pork sliders with Maple-Chipolte BBQ sauce for the superbowl~! it was so great, I even stashed some extras in freezer bags for another quick dinner! It was just my two boys and I for the game, we made pizza and chicken wings. My wife got home from work a little while before the game ended and we all had milkshakes! I shared on Twitter: https://twitter.com/FireRunner2379/status/829041851776786432. I made 7 layer dip and hot wings. I made 2 different kinds of homemade pizza and a veggie platter with homemade dips and salsa. We had made chicken wings, meatballs and mozzarella sticks. Thanks so much. One thing I made was hummus with veggies for dipping. We had 3 varieties of chicken wings (Honey bbq, General Tso’s and Buffalo) with celery, carrots and green onions along with ranch or blue cheese dressing . Made honey soy chicken wings. This looks so good. Can’t wait to try it. We usually like making cheesy nachos on game day! I made guacamole, no bake cookies and chili. I went to a friends house to watch the game. Oh this looks and sounds amazing. I have to add it to my little menu. I love to make smoked wings and some homemade dipping sauces as well have veggie tray! The truth is I was home alone for The Big Game, so I didn’t need a big assortment of appetizers and finger foods. It may not be very exciting, but I had a nice bowl of yogurt to which I added some honey and granola. For the Big Game day we had nachos stuffed mushrooms and hot chicken drummies and wings. Tacos! Thanks for the nice giveaway! My Sweepstakes entry: We had nachos & pizza. I made pizza for the game. I didn’t make anything special for the big game. I just had my usual chips and dip. We had meatball, veggie pizza and a few other appetizers. We had burgers and nachos. I am making for The Big Game this year some delicious Mega Nachos! How delicious: re-fried beans, salsa, cheddar cheese tortilla chips, ground beef mixture, peppers, diced Roma tomatoes, jalapenos, scallions , sour cream and grated cheddar cheese on top.